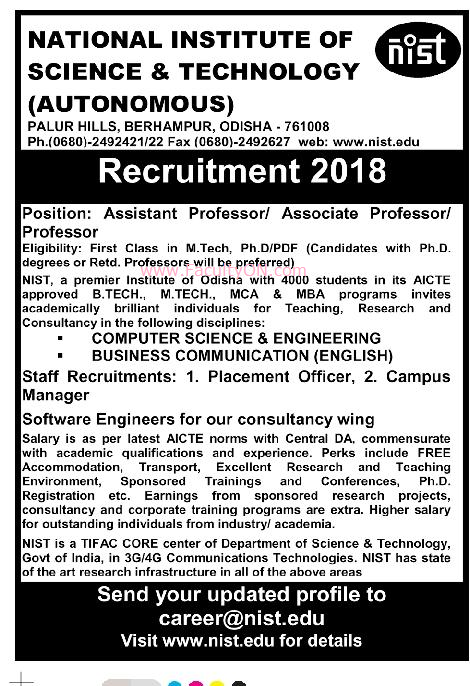 National Institute of Science and Technology, Berhampur has advertised for the recruitment of Teaching Faculty- Professor / Associate Professor / Assistant Professor Plus Non-Faculty jobs vacancies. Interested and eligible job aspirants are requested to apply immediately from 30th November 2018. Check out further more details below. About College: National Institute of Science and Technology (NIST) The National Institute of Science and Technology (NIST) was established in 1996 and is being managed by the SM Charitable Educational Trust under the vision and guidance of its renowned philanthropist and educationist Chairman, Sri Surendra Mudali. The Institute is approved by the All India Council for Technical Education (AICTE under MHRD, Govt of India) and is affiliated to the Biju Patnaik University of Technology (BPUT). The Institute campus of 60 acres is located at the picturesque Palur Hills about 12 kms from Berhampur and 3 hours drive from Bhubaneswar. First class M.Tech / Ph.D. Retired persons and Ph.D holders will be preferred. How to Apply: Interested and eligible candidates are requested to send application along with their CV, copies of certificates and PP size photo to the following email address given below.